We haven’t posted much about the Serra murders. At this point, with half-truths flying back and forth (mostly forth, i.e., from a single side of the aisle) nobody knows what really happened yet. The Serra murders, just like the Danilo Anderson case and even the Simonovis case, are hard to blog about from afar – getting things right requires an extensive amount of detail, an ability to parse BS from fact that, personally, we bloggers don’t do well at. This is advice David Smilde and Hugo Pérez Hernáiz should have heeded. I respect Smilde and Pérez Hernáiz and the work they do, mainly through their blog on Venezuela hosted by the non-governmental organization WOLA (more on them later), but their latest piece on the Serra murders is misleading and irresponsible. Their post is titled “Robert Serra Murder Roils Venezuelan Politics,” and it’s hard to argue with that. The Serra murders have caused quite a stir. But when you get into the text, that’s when you can see the manipulation. In the first paragraph, they say, “Government sectors have placed the blame squarely on the opposition, suggesting Robert Serra’s murder was the work of fascist paramilitaries or hit men directed by Alvaro Uribe in Colombia and right wing sectors in Miami.” “It is a hypothesis that cannot be discounted,” they say to start the second paragraph. First off, it is imprecise to say that government sectors have “suggested” the murder was the work of fascist paramilitaries. They have said so quite clearly! Here, for example, Diosdado Cabello and Nicolás Maduro clearly place the blame on fascist paramilitaries and the Miami mafia (whomever those might be). 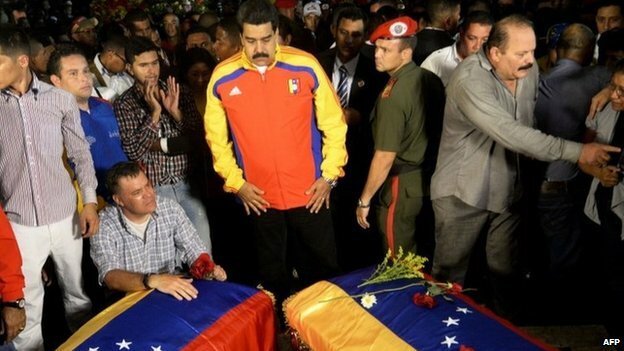 Here Maduro pins the blame on Uribe. So they are not “suggesting” anything – they are clearly, and directly making an accusation against a specific person, and deliberately tainting an entire political group. But, as Smilde and Pérez Hernáiz know, this is an accusation without proof. There is not a single piece of evidence that has been presented to the public of who exactly did the killing on behalf of whom. And yet, right there on the first paragraph of their piece, Smilde and Pérez Hernáiz plant the seed in the mind of the reader: the right wingers did it, helmed by that evil Uribe. At first, I thought Smilde and Pérez Hernáiz were going to write about how goofy the whole thing was, but no, they actually give serious thought to the idea that the former Colombian president was the mastermind behind the whole thing. Apparently, according to Maduro, Uribe hates chavistas so much, he is willing to train some guy named Lorent Saleh to hire paramilitaries to kill chavista VIPs. Smilde and Pérez Hernáiz seriously look into this, saying that Saleh is a “student leader” (one of many) who has been caught on tape making threats of a serious nature (that part is true). They also point out that the deceased Serra was heading a commission to investigate Saleh’s involvement with paramilitaries, something I was not aware of. That’s all interesting, and highly circumstantial. Now, Smilde and Pérez Hernáiz are free to spin their conspiratorial web and pin the whole thing on Saleh and Uribe (funny thing, Pérez Hernáiz actually has a blog on Venezuelan conspiracy theories!). But what our two friends leave out are two important pieces of the puzzle: one, Saleh is currently in the custody of Venezuelan authorities, making it practically impossible for him to have organized the whole scheme, and two, they fail to provide a motive for Uribe. Why would Álvaro Uribe, a former President and currently a Senator, go out of his way to kill a twenty-seven year old motormouth chavista legislator and his pretty assistant? Oh, right, because he’s Uribe, and he’s right wing, and that’s what right wingers do. They murder people. Tons of people. Look, who knows who did it. Maybe a week from now a video will emerge clearly linking Saleh and Uribe to the murders. Is it possible? Yes. Is it likely? Absolutely not. Is it worthy of putting in the lede of your post? You know the answer. When someone as fundamentally unserious as Nicolás Maduro hurls accusations such as this, it’s par for the course. But when two respected academics do so, it’s regrettable. But Smilde and Pérez Hernáiz don’t completely dive into what, so far, is the main hypothesis in their article. In fact, they abandon it half way, saying that “it should be said that the characteristics of the crime do not seem to fit with a paramilitary hit.” Why yes, it should be said clearly, not buried in paragraph six of their post. The authors then delve into the police work, mentioning there was no forced entry, and that murder by stabbing is unusual in paramilitary “hits.” Further down, they even cast doubt on the government, saying that they have been proven wrong in criminal cases before without them changing their stories. It seems like they want to believe Uribe was guilty, and are disappointed that he probably isn’t. What the authors leave out is that the reactions from the opposition have been overwhelmingly positive. Condolences for the deaths came from all quarters. The opposition umbrella group MUD even suspended a political rally it was going to hold on Saturday out of respect for the other side. And Chúo Torrealba, new Secretary of the MUD, has shown remarkable restraint, basically saying nothing after Maduro called him “human garbage” on national TV. But no, according to Smilde and Pérez Hernáiz, “acrid exchanges” have come from both sides. The only thing they see worth repeating is this whole saga is how disappointed the government is by the opposition’s “reaction” to the murders. I guess Maduro is disappointed by how civilized the opposition’s reaction was. Look, Smilde and Pérez Hernáiz are entitled to be biased. The NGO they blog for, WOLA, has a clear left-wing slant to it. That’s fine, that’s their prerogative, and I’m certainly not going to be the one pointing fingers at biased blogging. But when they start passing off government propaganda as cold analysis under the veneer of impartiality, they don’t do themselves, or the Venezuelan political process, any favors. They need to be able to parse BS from fact when writing about Venezuela. On the Serra case, they are failing at it.